The Moov HR Sweat is a fitness-focused wearable that's all about monitoring heart rate-driven workouts and combining that with real-time coaching to make sure you're really putting in the maximum effort. Successor to the Moov and the Moov Now, winner of our Sports Wearable of the Year at the first ever Wareable Tech Awards, the HR Sweat is clearly trying to capitalise on the big HIIT (high intensity interval training) fitness trend that's happening right now, where the emphasis is on more intense workouts for shorter periods of time. So Moov has built a new sensor with an optical heart rate monitor, kind of like the one you'd find inside a Fitbit or an Apple Watch. The big difference here though is that this HR sensor is held inside a headband to take those readings from the head, rather than the wrist. Why? Because Moov believes it will get more accurate results there. Priced at $99.99, the HR Sweat is more expensive than the Moov Now, but does open the door to a host of new guided workouts. We've been pushing our heart to the max to see if the HR Sweat headband is as impressive as the first two Moovs. Here's our comprehensive verdict. Like wearing headbands? Well, you're going to have to if you want to make the most of the HR Sweat. The setup consists of a thin, black, machine washable headband made from nylon and spandex that's a whole lot more noticeable than wearing a heart rate monitor on your wrist or underneath your clothes. It's designed to be worn by all, but it's definitely better suited to those rocking longer hair. Inside the band you'll find a small silicone casing and that's where the Moov HR's Core (or sensor) is held in place. It's a bit bigger than the one used on the Moov Now, which is largely down to the inclusion of the optical heart rate sensor. But it is still a tiny little thing and very easy to lose in the bottom of a gym bag. There are no buttons to worry about here, but you can tap on the Core to wake it up and pair to the companion app when you need to start a workout. When it's time for charging, there's a small charging cradle that clips onto the back of the two charging pins on the sensor. So let's talk about the forehead, and just why Moov has decided to move heart rate monitoring further up the body. We've talked plenty about the issues around taking heart rate from the wrist, and why chest straps are still considered the most reliable way of measuring this piece of biometric data. Things are getting better, but there are still many factors that can affect a reading from a wrist-worn wearable. So Moov has decided to pick out a different area and it has chosen the head. Specifically, the temples on the side of the head, where it believes the skin is thinner, sensor movement is reduced and the increased blood flow can deliver accurate heart rate monitoring. It's worth mentioning that if you have a Moov Now, you can combine the two wearables to track movement and heart rate at the same time. There are workouts designed to bring the two together, including high intensity running or indoor cycling so it's a good fit for spinning classes as well. When it's time to get that heart pumping, the HR Sweat is really easy to set up. 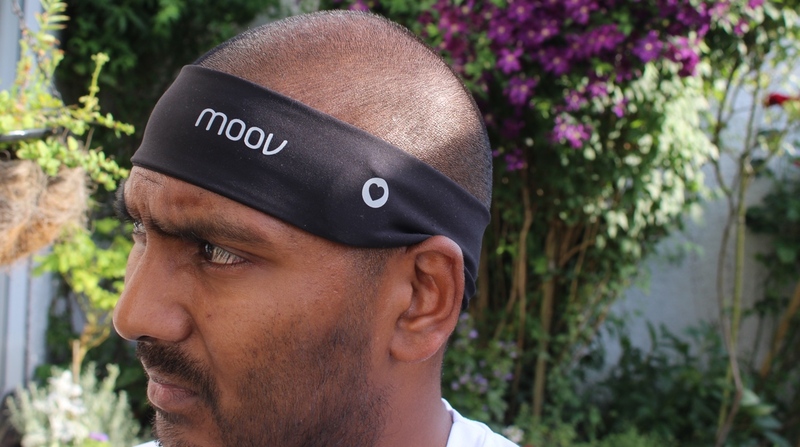 Once you've got the headband in place, which can take a few attempts to ensure heart rate is being read properly, you'll need to venture into the Moov app and pick out your workout. If you've used a Moov device before it's all going to feel very familiar. The app now breaks down workouts by device so you can quickly determine the exercises that support the HR Sweat. Currently, there are eight workouts options in total. There's HIIT Foundation, Cardio Blast, Athletic Conditioning, Explosive Power, Running, Indoor Cycling, a HR recording mode and open HR training. While it's a small group of options, it does offer a decent variety in terms of the different things you can work on. So the Cardio Blast is all about burning fat, while HIIT Running is about increasing aerobic and anaerobic fitness. When you delve into these workouts you can also tinker with effort levels going from beginner to intermediate, advanced and custom options. These effort levels increase the workout duration and gives you a breakdown of the kind of workout you can expect. We should also mention that all of these workouts need to be downloaded first, so it's something to be aware of if you're trying it out somewhere that doesn't have an internet connection. Once you're good to go, Moov will need to determine your average heart rate and heart rate zones and then prompt you to pair the sensor, which can be done with a gentle tap. You should then see a reading to indicate whether you've got the headband on correctly. If you're going to do a circuit workout, you'll be able to follow exercises on your phone or tablet with a set of colours down the side of the screen and a hovering cursor that indicates your current heart rate zone. If you're doing an indoor cycling session, things will look slightly different. You'll have to swipe through multiple screens to see current heart rate zone and the target zone. One of the reasons we love the Moov ecosystem is the real-time coaching and once again it shines on the Sweat HR. It'll prompt you with advice on how to get up to the required heart rate zone and how to correctly recover between intervals. It's particularly good for HIIT running and cycling where it will tell you to increase cadence or intensity to be able to comfortably get up to the next target interval zone. If you want to be pushed, the Sweat HR will work you hard and we can guarantee you will feel that burn. It's tough, but you know that you've had a good workout afterwards. If we have one criticism of the coaching it's the rather robotic tone of the coach, which can feel quite tiresome and irritating, especially when it delivers instructions in quick succession. As far as working out with the headband on goes, it's undeniably a different experience from a watch or a chest strap. It's generally quite comfortable and doesn't move around, but when you start to get a sweat on, there is the temptation to take it off as it can get a little warm under there. While we found the headband a little irritating when running outside, it came into its own during spin class workouts. During the intensity of a HIIT workout, we found the band did a good job of mopping up sweat. It's very much down to personal opinion. So this is the big thing. Can Moov deliver on the accuracy front? The answer is yes. If you've got it positioned correctly, we found it was up there with the data from a chest strap. We put it up against the Polar H10 and the heart rate monitor on the Garmin Forerunner 935, and whether it was cycling, bodyweight workouts or running, it was at most one or two bpms out. Most of the time it was spot on, as you can see from screens below. This kind of accuracy is always important, but when the focus is specifically on heart rate based workouts, it's even more crucial. Thankfully, Moov is able to deliver the goods on this front. Going against the design norm has certainly paid off for Moov here and if you're happy to wear it, the good news is that it can be used as heart rate monitor with third-party apps as well. So if you don't trust a wrist monitor or like wearing a chest strap, you could always give this a go. Battery life on the HR Sweat comes out to around six hours, which is pretty much what we found during our time with it. If you consider the fact that most of the workouts last about 30 minutes, that should get you through one workout a day for a week, which is likely to be enough for most. The Moov HR Sweat set out to deliver HIIT workouts with accurate heart rate monitoring and coaching that really pushes you. Did it achieve that? Yes it did, albeit with a pretty silly looking headband as part of the deal. Investing in the Moov Now is also something you need to factor in as well, otherwise you're not going to reap the benefits of the great running and cycling workouts that are included. There's a lot to like about the HR Sweat, but there are also a few things that prevent us from loving it as much as we loved the Moov Now.